Bolt-on O.E.M. 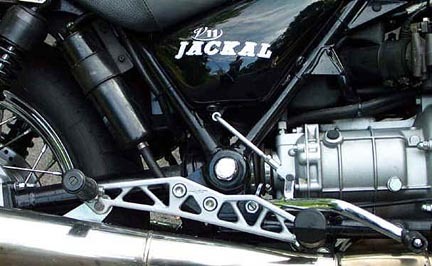 rearsets for your Jackal by David W.
The SP II, T-5 and Mille parts are interchangeable. 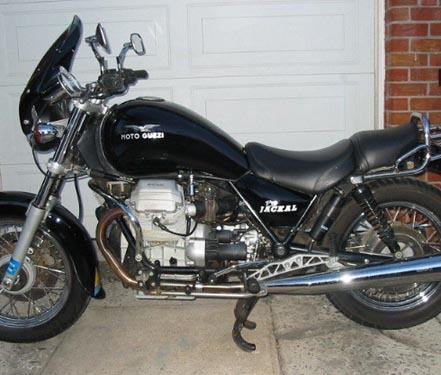 NOTE: Ask your friendly Moto Guzzi dealer to look up the part # for a Mille GT brake lever and an SP II brake lever. In fact, you should look up all these part #s on the microfiche just to be sure. Once you have all the pieces it will only take an afternoon to get it all together. I used the 4 stock 12 MM bolts to attach the hangers but you can substitute as you see fit.